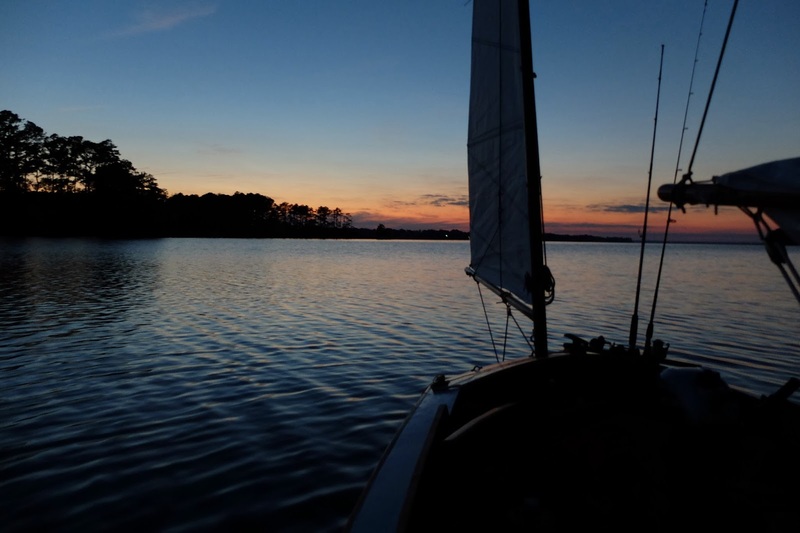 With fog to the west, dawn breaking to the east, I haul the anchor and feel the warm water on my hands against the cool morning air. 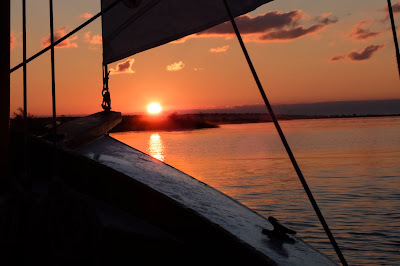 Peaceful sailing down the bay at a knot or less, just off the cord grass where I can hear the marsh hens calling. A great blue heron takes flight. The low marsh is backed by tall trees, Maiden Point on the south side of the bay is just a thin dark line hovering above the water. Schools of baitfish ruffle the surface, an eagle circles, dives and then flies to the tall trees. The breeze freshens, the bow gurgles. 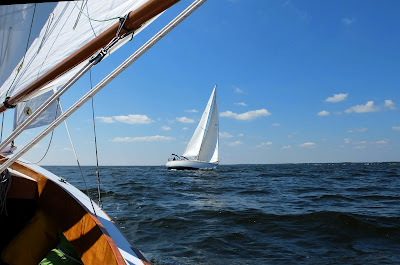 Boar Point at 9 a.m., we sail wing and wing to the southwest on the edge of Pamlico Sound. Bay Point 30 minutes later and we cross the mouth of the Bay River. Far side of the river we find more wind, and Spartina skirts of the green grass and white sandy beaches south of Maw Point as I cast for fish in the shallows. Three sails on the horizon, two shrimp boats and the sun glitters on small waves. We begin to feel the heat of the day. The wind falters off of Gum Thicket, then returns about noon. 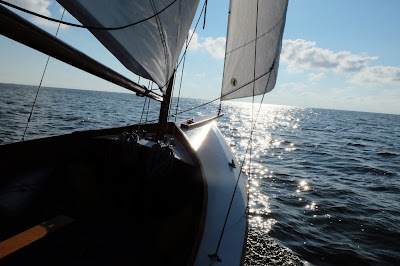 A beautiful fall day, the cooling breeze tempering the hot sun and making 4.8 knots to Adams Creek. 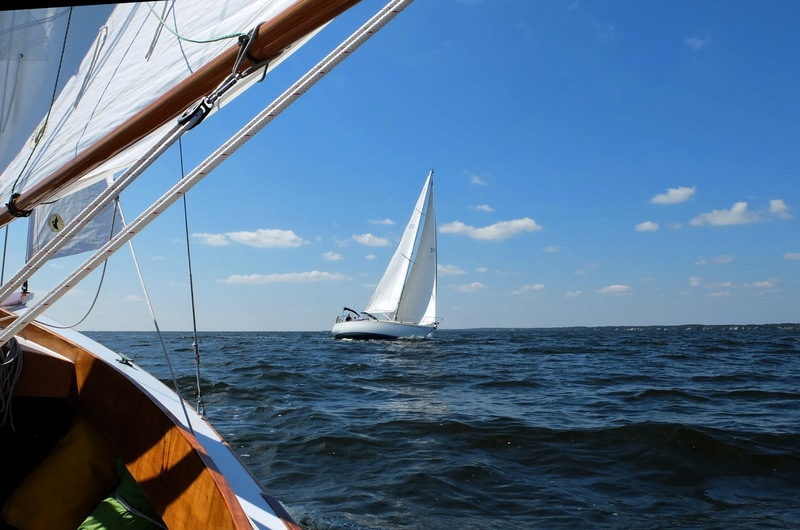 The bow makes a whooshing sound sliding down the waves on the Neuse River. Steady traffic at the mouth of Adams Creek. 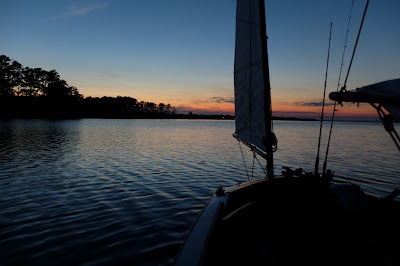 Cruising sailboats, a barge and shrimp boats converge where the ICW winds into the creek. 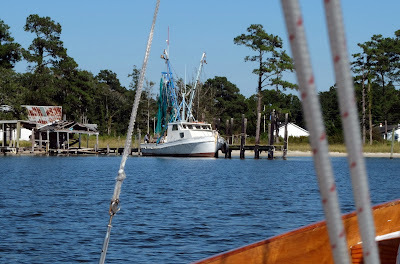 A wave from the captain of the "Three Maries," white hull and green nets on the shrimper out of Sneads Ferry. Houses on wooded points, shrimp boats tied to old docks, the creek heads south and then southeast past Sand Huss and Dumpling Creeks. At marker "9" we turn east into an anchorage with a lone sailboat. The creek branches out with Jonaquin Creek to the north and Cedar Creek to the south. We turn toward Cedar Creeks with its marshes on one side and an old fish house - the chiller cycling on and off - on the other. Under mizzen and jib we round up along the marsh to make a few lazy casts, letting the lure fall near the grass and bouncing it along the bottom. Then an unexpected sharp tug on the line. 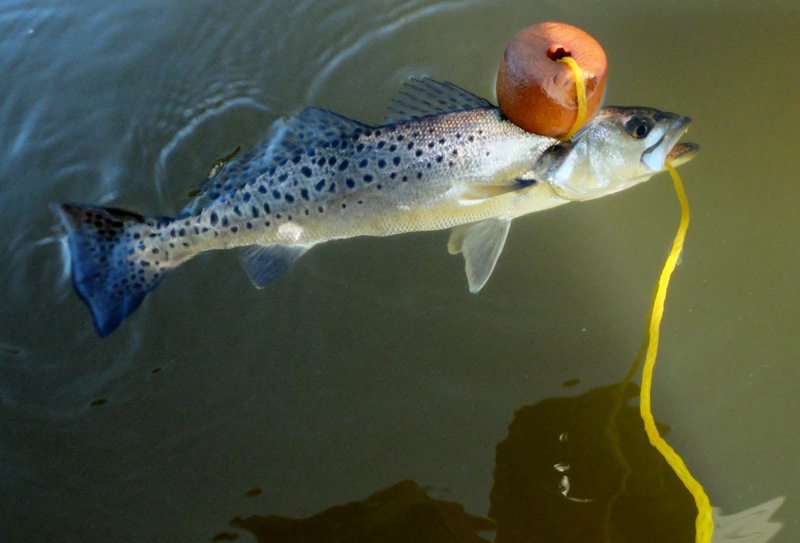 Fresh trout for dinner on a bed of curried rice out of a freeze dried pouch. Dishes clean, we motor around the corner, the cycling chiller at the fish house making enough noise to disturb a peaceful evening. Anchor down about a hundred yards from the other sailboat, I rig Spartina for a night sleeping under the stars.